Drinking On The Run - It's Not Always Easy! Hopefully if you’re running a half marathon or longer you know how important it is to drink water during the race. Unfortunately, sometimes it’s harder than it sounds for one of three reasons. The good news is that you can easily solve all of them! Just as you’re about to take a cup from a volunteer, the guy in front of you grabs it! In a crowded water stop this can be a problem. 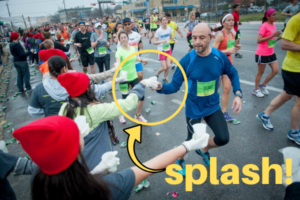 The best way to avoid this is to make eye contact with the volunteer that you intend to take the water from (before you get to him or her), and point at them as to say “that cup’s for me, don’t let someone else grab it!” It won’t always work, but it usually will. By making contact with the volunteer they become your ally and they’ll try to help you if they can. Try it! When you are able to grab a cup from a volunteer, half the water splashes out! There are two causes for this. The first is the volunteer not being properly trained and holding the cup wrong. If you zoom in on the photo above you’ll see 4 of the volunteers holding the cup on the palm of their hand (that’s the right way). However, the volunteer that we have circled in the photo is holding the cup by the sides (the wrong way). As the runner takes the cup it will be forced against the hand of the volunteer and water will go splashing out of the top of the cup! Obviously the volunteers are doing their best to help, and the best way you can avoid this is to look for a volunteer holding the cup on their palm. Once you have your cup of water, half of it runs down the sides of your mouth and face as you attempt to drink while running! What you want to do is gently squeeze the rim of the cup to close it off and create a pour spout (this is also explained in the video below). Then you can drink from the spout without spilling. The video also explains how to get two cups without spilling either one of them! Lots of races will have water on one side of the street and a sports drink on the other (or water first, followed by a sports drink). Make sure you know what you’re getting and stick with water. Search the web and you’ll find numerous horror stories of drinks being mixed too strong and causing people to throw up, etc. Or high sugar drinks causing a sugar crash or GI issues. 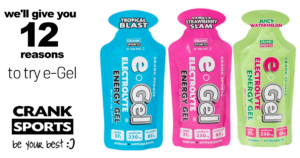 The best thing to do is to take water and carry your energy gel. That way you can train the way your going to race and not have any “surprises” on race day! If you”re going to use a gel we obviously recommend e-Gel, click below for 12 reasons why!